Wall decoration is the impression builder of the whole cubic space, which can render the space atmosphere effectively, and to create a unique and distinctive impression to the interior space. Once we referred wall decoration, inertia of thinking will always make us concern to three things: paint, wallpaper and color painting. 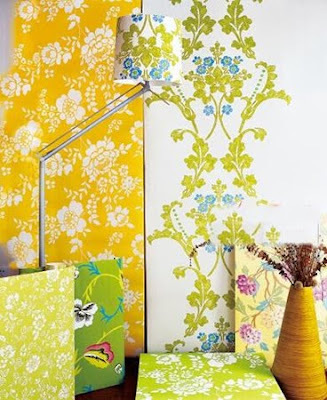 So in 2009, what kind of new coatings is in fashion for the wall decorating? Can sawdust also be posted on the wall? The answer is: Yes, and the results were pretty good. This is a new term of wall decoration especially popular in this year - wood fiber. According to the introduction of designer, as the visual effects of wood fiber is outstanding, colors bright, simple and generous, wide variety of colors and easy to match with furniture, so there is a very wide application to its suited style, now this kind of wall decoration were mainly used for walls of TV backdrop, bedroom or study to do modeling decoration, but it is not suitable for large-scale use. As it is called wood fiber, actually it was pressed with wood fiber, wood pulp, cotton fiber and a small amount of quartz, because containing quartz, which makes it shiny, but in fact it is a member of the wallpaper family". With the designer's guide, the author came to a light yellow wall covered with wood fiber, and found it is really shiny, and rich in texture. Reach to touch it, felt very rough, and looked closely, there are many tiny cavities on its surface, which shown in granular and uneven. "Does such a wall easy to care for and maintain? Do those cavities inside it will not conceal dust?" the author asked. "Of course it is easy to care for and maintain, you can use a horizontal filter of vacuum cleaner to clean it directly” said the designer, “and it is also very simple to install this type of wallpaper, you only need to do some basic processing on the original latex paint wall” On another side, "wood fiber can also be repaired and overall moved, but pay attention to avoid knocking and bumps”.